Pack Baixo Elétrico Fender SQ Affinity PJ Bass Pack BSB. Cor: Brown Sunburst. 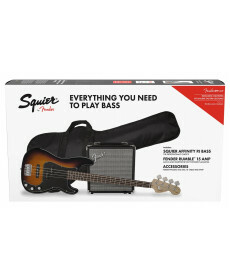 Ideal for first-time players, the Squier Affinity PJ Bass Pack includes an Affinity Series Precision Bass with a powerful split-coil P Bass® middle pickup and a growling J Bass® single-coil bridge pickup.